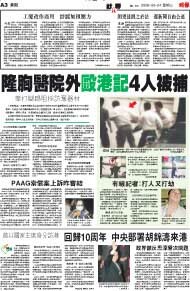 A group of mainlanders attacked two reporters from Hong Kong outside the Shenzhen Fuhua Hospital on Tuesday while the reporters were covering a compensation lawsuit over the hospital's use of a toxic gel (PAAG) in breast enhancement. The reporters, from two Hong Kong television stations, were surrounded by at least 10 people who had emerged from the hospital. The attackers, including women wearing white medical gowns, punched and kicked the reporters and at one point drew water pipes. 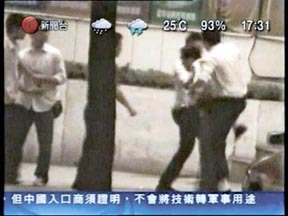 The Shenzhen Public Security Bureau later arrested five mainlanders in connection with the attack. 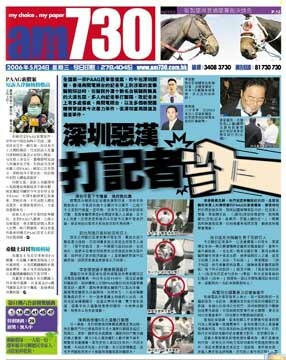 Shenzhen hospital security guards armed with iron bars punched and kicked Hong Kong reporters yesterday in their second assault in two days on journalists covering a compensation lawsuit over the hospital's use of a toxic gel in plastic surgery. Women in white gowns joined in the attack. 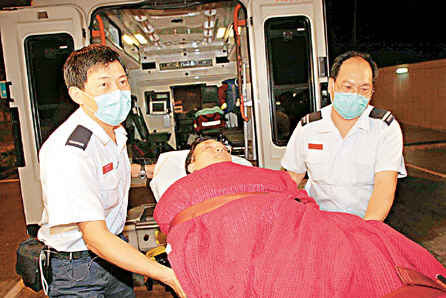 Later, a South China Morning Post reporter was assaulted in the same spot outside the hospital. 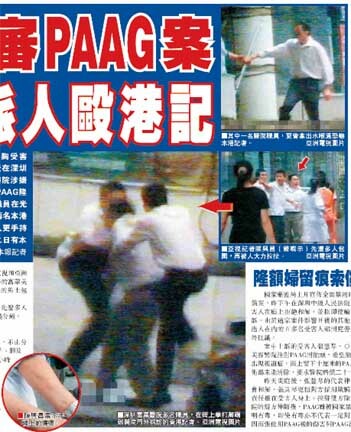 Cable TV reporter Li Ka-chung was checking on notices posted outside the Shenzhen Fuhua Hospital, which is fighting a compensation case over use of the toxic PAAG gel, when the security guards attempted to pull him away. 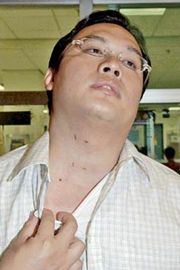 They snatched his mobile phone, and assaulted Li and ATV reporter Anderson Chan Hing-cheong when the latter intervened. "They knocked my cell phone to the ground. 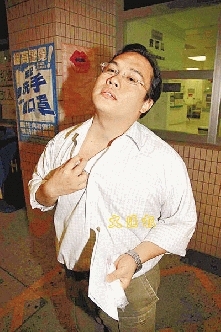 When the ATV reporter tried to help me, he was attacked by several guards," Li said. Minutes later, women in white medical gowns approached and began assaulting them. They only let go when public security officers arrived - at which point a man left the melee carrying iron bars. In the afternoon, three security guards stopped a Post reporter taking photographs and tried to wrestle his camera from him. The attacks came after five journalists and cameramen were attacked outside the hospital on Monday. Outside court yesterday, a Cable TV reporter identified a man as one of his attackers and asked him the reason for the assault. The man broke into a trot as he tried to dodge reporters and get to his car, shouting: "I am a patient." On Monday he had identified himself as someone from the hospital. All the attacks occurred in a public place beyond the hospital boundary. Reporters asked police to intervene. But a police officer said it was a "personal dispute". "Nobody is allowed to take pictures of our hospital," a guard said. "Yesterday the State Council sent someone to investigate. Even they were not allowed to take pictures." 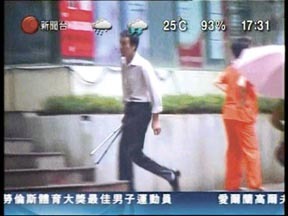 The Hong Kong News Executives' Association called the assaults barbaric. The Hong Kong Journalists Association called for a thorough investigation. 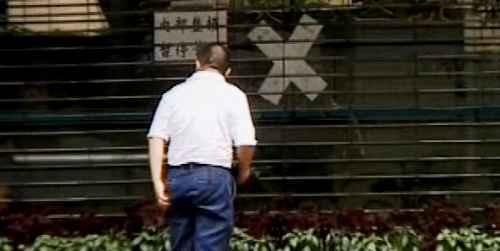 Cable TV said it had reported the case to the Public Security Bureau, Shenzhen Information Office and central government liaison office in Hong Kong. ATV also said it had reported the case. The Shenzhen Information Office said Mayor Xu Zongheng had expressed concern over the incident and ordered police to investigate. Late last night it said police had detained four mainlanders over the attacks. We strongly condemn the recent attacks on Hong Kong journalists in Shenzhen and urge the Public Security Bureau to investigate the incidents. The latest attacks occurred on Tuesday as a mainland court began hearing a compensation case over the Shenzhen Fuhua hospital's use of the toxic PAAG gel in breast enhancement. As the case is of interest to many people who have used the gel, it is journalists' duty to cover the latest developments in the hospital. Those attackers, who claimed to be hospital staff, punched and kicked reporters to prevent them from reporting the news. This is barbaric. We do not have high hopes that a mainland city such as Shenzhen can do as much as governments in the developed world do to protect journalistic freedom. But it is the government's responsibility to protect journalists' safety, which is a basic right. Below are the pictorial coverage of the events by the Hong Kong newspapers. Please note that the media were not all there, but they will definitely share their films, photographs and reports when their own colleagues are assaulted to achieve maximum impact on public opinion and pressure. This occurred across the entire political spectrum of the newspapers because no matter what your position is (e.g. 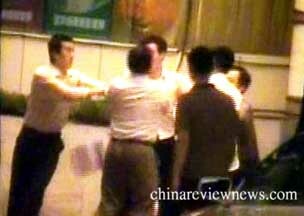 pro-China or pro-democracy), it is just wrong to assault any reporter trying to gather news. Mainland media should note this type of solidarity is a powerful form of protection -- nobody will think about assaulting one reporter when they know that the whole country will know about this the next morning. P.S. 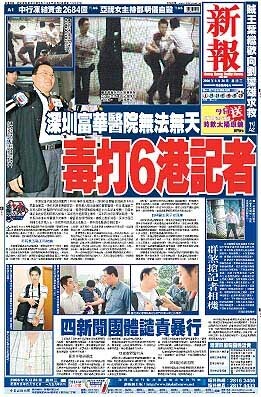 Shenzhen media are completely silent on this matter today due to an official ban. They were notified to wait for the official statement, which has yet to appear. P.P.S. Here is the link to Southern Metropolis Daily (of Guangzhou), one day later. They used some of the Hong Kong photos and the coverage is lengthy and proper. This does not read like an official statement, so they must have received permission to report as they saw fit (with some guidelines, of course, such as not speaking about the restraint on them yesterday). The report also indicated that a Shenzhen-based SMD photojournalist was assaulted by unknown persons on May 16 and sustained a broken nose. Now that was not a well-publicized incident. Picture 1: The flying kick; Picture 2: The gang attack; Picture 3: the steel pipes to be used as weapons. The ATV reporter is being taken away in an ambulance. The police later came and said that they were not there to investigate an assault case; rather, they only there to handle a "dispute" in accordance with normal procedure. 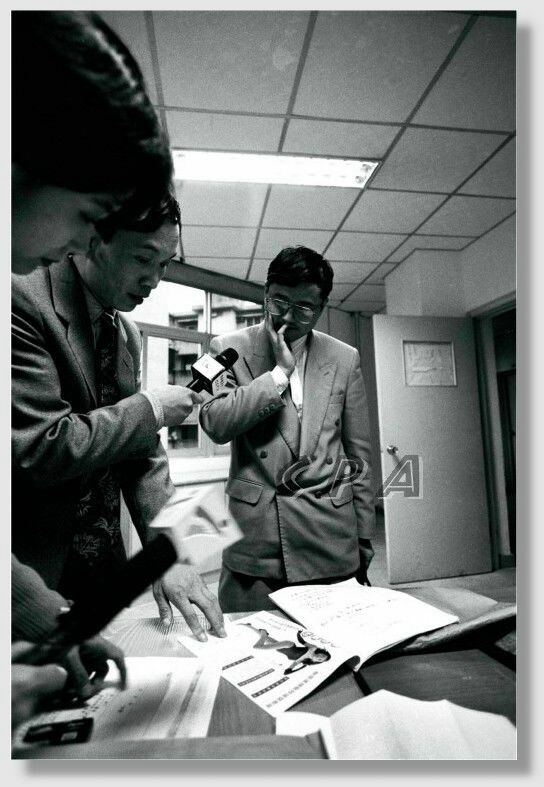 By the way, the blanket news coverage must have hit the Shenzhen Mayor hard. As the government leader of a "civilized city," he ordered an investigation. Five people have now been arrested. On the day before yesterday, a reporter from Cable TV was assaulted. Yesterday, his attacker was observed to be in court and identified by the assaulted reporter. When the man left, he was mobbed by other reporters. When asked why he assaulted people, he said, "I don't know." When asked if he was a leader, he said, "I'm just a patient seeking treatment" and then he jumped over a concrete barrier and ran through the vehicular traffic to the other side of the road. A Shenzhen hospital - where Hong Kong reporters were attacked - has been closed down temporarily by health authorities. Local radio reported on Wednesday afternoon that five hospital staff had also been arrested over the attack as police sealed off the hospital - citing its "chaotic management". 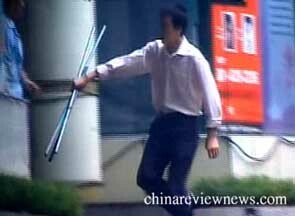 Local radio also reported that the metal gate at the main entrance of the Shenzhen Fuhua hospital had been closed. A notice issued by Shenzhen's health authorities had also been posted on the front doors. It said the hospital would be closed until May 30 for "reorganisation". ... Security for Secretary Ambrose Lee Siu-kwong said on Wednesday his staff had contacted the office of Shenzhen Mayor Xu Zongheng over attacks on journalists. 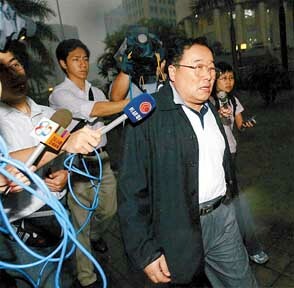 "The Hong Kong government is very concerned about the attacks on Hong Kong reporters in Shenzhen," Mr Lee told reporters. "The mayor's office promises to handle the incident seriously, impartially and according to law," he said. 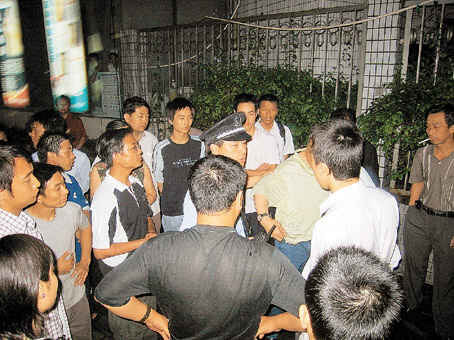 Mr Xu said the city would protect journalists' rights to conduct interviews. In a statement released late on Tuesday, Mr Xu said he had ordered police to give priority to the case and punish those responsible. (The Standard) Shenzhen hospital sealed off. By Mimi Lau. May 25, 2006. A Shenzhen plastic surgery hospital accused of performing illegal breast enhancements has been ordered closed by health officials. At the same time, the Public Security Bureau is investigating assaults on Hong Kong newsmen by guards and staff of Shenzhen Fuhua Aesthetics Hospital Monday and Tuesday. Citing the hospital's "chaotic management" and the need to preserve evidence for investigation, the Municipal Health Bureau ordered the hospital closed until May 30. The bureau said its investigation will focus on whether the hospital had performed enhancements using hydrophilic polyacrylamide gel, or PAAG, after the substance was banned across the country in late April. It expects the investigation to last about a week. The bureau said it had sealed the hospital to investigate public complaints about its use of PAAG implants. A bureau spokesman said the hospital will not be allowed to admit new patients although current patients will continue to receive care. Meanwhile, the hospital's deputy chief and four other medical staff were arrested Wednesday in connection with the attack on Hong Kong journalists covering China's first civil lawsuit against the use of PAAG implants. The Public Security Bureau said six people were being questioned in relation to a "crowd fight" after hospital staff refused to allow television filming outside the building. The PSB said it had received reports of journalists being attacked Monday night and the following afternoon. 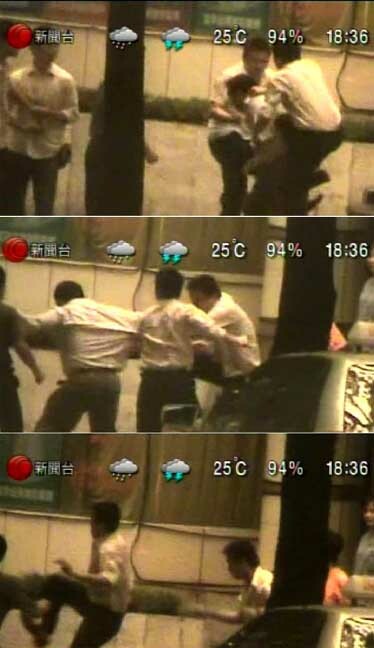 Hong Kong television stations showed ATV journalist Anderson Chan Hing- cheong being kicked and punched, and his mobile phone being confiscated, Monday night. Chan suffered bruises and scratches to his neck, back, arms and legs in the melee. 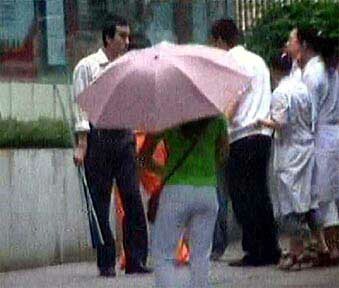 At one time in the fight, women in white coats were seen joining a group of males in the attack. Shenzhen mayor Xu Zhongheng ordered an investigation and vowed to preserve public order and protect journalists' rights to cover news events. Hong Kong security chief Ambrose Lee Siu-kwong said the SAR government was concerned about the incident but was confident Shenzhen authorities will handle the case fairly. Perhaps the PAAG gel story is not that easy to explain because this treatment has really not been tested in clinicial trials (and hence the defense takes the position that the treatment has not yet been proven conclusively to be harmful). The following are pictures taken from a different case, also in Shenzhen, to give you an idea what happens when the medical professional is incompetent. You are forewarned that the pictures at the end are graphic. (Wenxue City) Location: Shenzhen Chinese Traditional Medicine Spring Wind Clinic, Cosmetics Specialty Department. 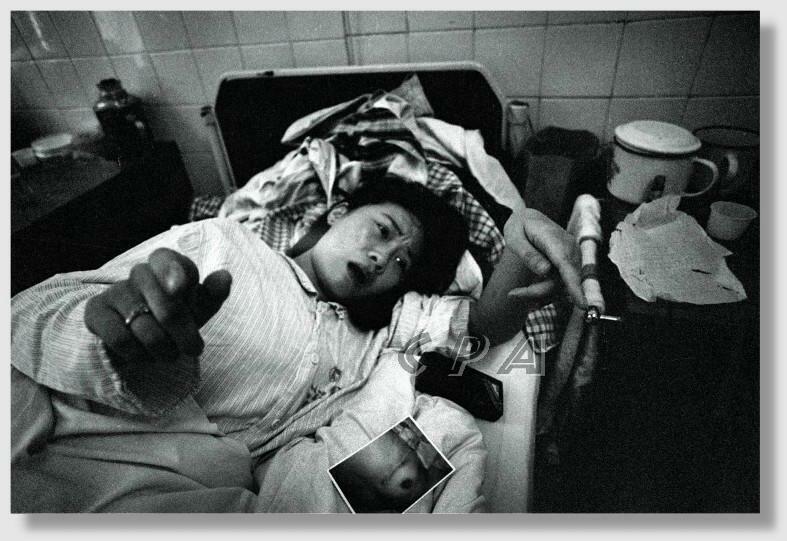 The following photographs are for the case of Ms. Wang, aged 22, who spent 10,000 RMB for breast enhancement surgery. After the first operation, she caught an infection. 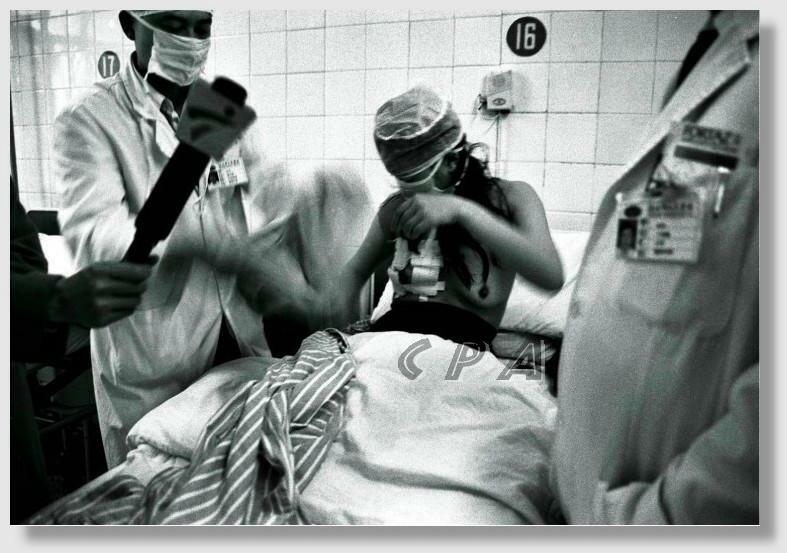 She had to undergo seven surgeries in total, with 10 open wounds required to drain fluids from her body. The doctor had nothing to say to the reporters.